I don’t know about you, but one of my favourite things about travelling to a new country is trying all the different types of food on offer: the new flavours, the dizzying varieties, the people behind the small eateries and food stops. Colombian street food is a mish-mash of fried food, creamy drinks and all types of corn manifestations, and after so many years of trying to sample them all, I think I’ve done it! So, here’s my guide to my favourite Colombian street food! Have something to add to the list? Let me know in the comments section below. Try some of these foods by organising your own street food tour. How could I begin a list of my favourite Colombian street food and not put arepas first on the list? I just couldn’t. Arepas come in all different shapes and varieties, depending on what area of the country you’re in. There are the thick and cheesy types to the soft and sweet morsels and, you know what, I love each and every one of them. These humble corn discs are well worth hunting down on the streets of Colombia. The arepas you can see here are arepas de chocolo and are made with sweet corn and topped with cheese. Almojabanas are an any-time-of-day staple in Colombia. They’re a soft pillow of cheese bread that tastes best when it’s warm and straight out of the warmer. People often eat this snack on the go, with a coffee or for breakfast. Actually, the Almojabana is the perfect all-day snack. 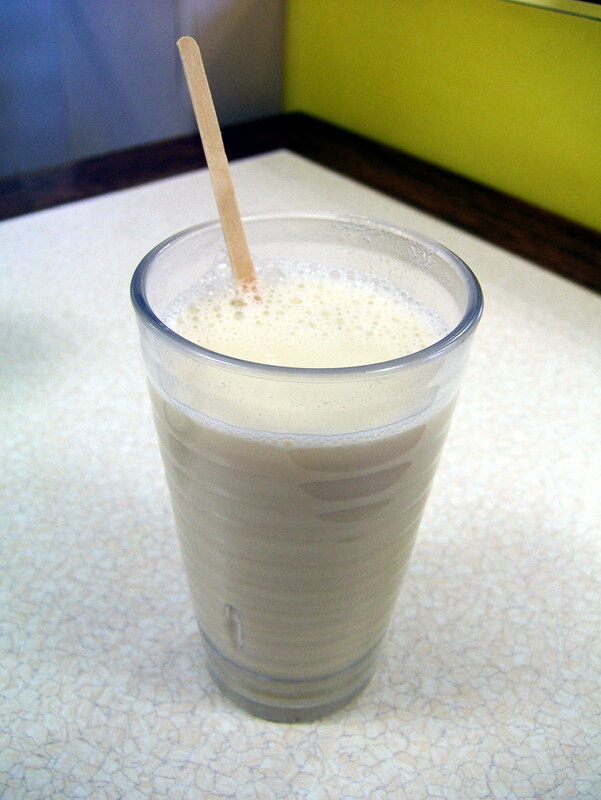 A oatmeal-based drink, Avena is a creamy thirst-quencher with an almost custard-like consistency. Ask the locals where the best place to go for a cup of avena is, because, like many Colombian street food varieties, the quality of a good cup can be a bit hit and miss. This drink is one of my absolute favourites! Bunuelos are cheese balls that are commonly eaten during Christmas time, but they’re just so darned tasty that you can find them sold in kiosks around the country all year round. Buy them fresh from the fryer and you will fall in love with this Colombian street food favourite. Champus seems to be one of those drinks that you either love or hate. It’s a mix of corn and fruits like lulo and pineapple and is one of the drinks of choice in Cali. It’s both a drink and a snack – you eat it with a spoon. I love it, but it’s not for everyone! It was in Villeta that I discovered the delicious Caleño drink, Cholado. It sounds pretty interesting – condensed milk, fruit, cordial and topped with Milo, but I promise you, it’s delicious. Churros in Colombia aren’t the same as the churros in Spain. They’re not commonly eaten with chocolate, but rather sprinkled with sugar and eaten straight from a paper bag. Yum! Like in many South American countries, corn is a much-loved staple in Colombian cuisine and same goes when it comes to Colombian street food. Grilled on a stick, a corn on the cob is a great, fuss-free street food snack while travelling around the country. Dulce de Pata is one of those Colombian street foods that looks interesting and kind of delicious, in all it’s gooey glory, but once you learn it’s a sweet made from pigs feet, you might change your mind. I’m going to be honest with you here, empanadas can be a bit hit and miss in Colombia. You’ve got to know where to go. Just watch where the locals go. I came across an awesome little empanada spot in Medellin, just around the corner from Exito in Estadio and wow. Those empanadas blew my socks off. Follow the locals and watch what they eat for some really good Colombian street food, worth ditching the restaurants for. Fresh juice is an important accompaniment to lunch in Colombia, but it is also available through vendors on the streets. Orange juice is particularly popular, especially on Ciclovia Sundays in Bogota. There are so many varieties of fruit in Colombia so it comes as no surprise that vendors sell them from the calles. You’ll find all different types of fruit and vegetables stacked by the roadside including watermelons, bananas, mangos and many more. This is one of the most traditional drinks from the Valle de Cauca region. It’s made by mixing lulo with water, ice and sugar. Apparently it makes for a pretty good cocktail too, just add alcohol. Marranito means the little pig and it’s a plantain-stuffed snack, but this time the plantain is savory and it is filled with chicharrón or fried pork rinds. This Colombian street food meal was one of my go-tos while in Bogota. It’s not the healthiest of meals, but I tell you, if you find a good place to get it, it’s delicious. It’s basically a stack of chips, corn, your meat or vegetable (hah! vegetables? As if!) preference and loads of cheese smothered with sauces. Definitely a sometimes food. Now, if you’ve travelled to Colombia, then no doubt you’ve seen vendors selling obleas on street corners. They’re pretty much the perfect quick cold-climate dessert. It’s basically like an ice-cream but without the ice-cream, are you following me? You take two round pieces of wafer and coat anything from arequipe and crema de leche to strawberry jam and pineapple in the middle. They are delicious, go out and get one right now. Go on! I get the feeling that the pastel is Colombia’s answer to the pie. It’s a pastry usually filled with either chicken or beef and is an easy grab-and-go kind of lunch. Deliciously soft cheese bread, pandebono is sold everywhere around the city of Cali and are mostly eaten for breakfast. There are a couple of stories about how Pandebono got its name – some say it was because of an Italian who used to call them Pan de Buono or ‘the good bread’. However it got its name, you know a bread has got to be good when it features in a classic Salsa song by Grupo Niche. They lyrics are: ¡Esto es cuestión de pandebono! Azucar! I first came across Picada at the top of Monserrate in Bogota. It is a plate of different cuts of meat, as well as some papas criollas and then stewed in herbs and their own juices. 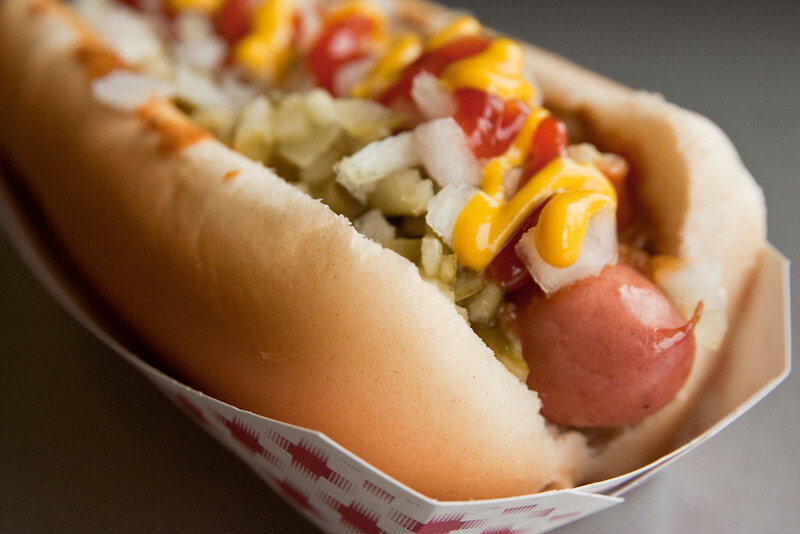 Hot dogs, or perros calientes, are a popular street food around the world and Colombia is no different. Here you can buy a hot dog topped with potato chips, cheese and several different sauces. People love their plantains around the country and they are a very popular Colombian street food. You’ll often see people peddling a makeshift store on wheels with a case of fried plantain crisps at the ready. 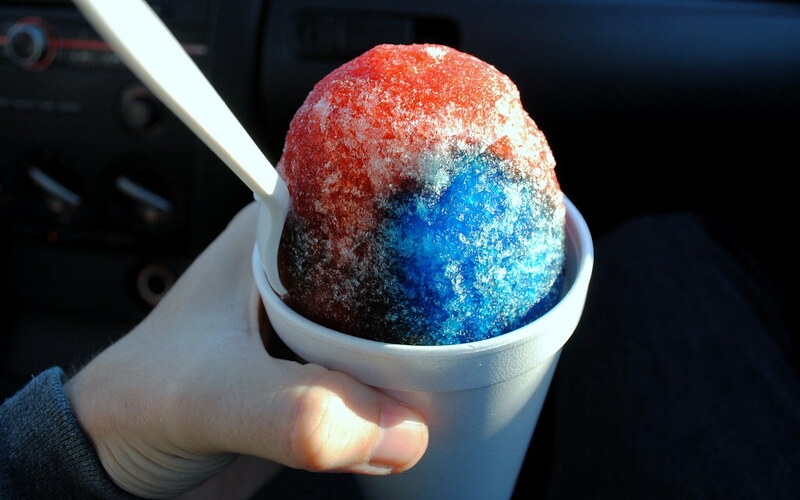 Who doesn’t love a good snow cone on a hot day? In Colombia they’re called Raspao and you can find them being sold in main squares in small towns where the temperature gets particularly hot. What do you get when a cross a sausage (salchicha) with a potato (papa)? Oh, new amigo, you get a quick and easy Colombian street food called the Salchipapa. It’s basically just a plate of hot potato chips and cuts of fried sausage, but when there is nothing available and you’re walking home with hunger pains, salchipapa will do! Tintico (or little coffee) is a morning go-to for Colombians and you’ll often see people huddle around a street vendor buying their morning cup of brew. Sure, coffee isn’t technically a Colombian street food, but it is an absolutely staple, so I just had to include it. What’s your favourite Colombian street food? Give me food envy by letting me know in the comments section below. What haven’t I tried yet? Let me know! Hi Sarepa, greettings from Colombia, I’m fascinated with you blog, all these foods are really delicious, thanks for showing to the world our street gastronomy. Hey I just gotta say I love this post. I’m part Colombian and I’ve been there myself a few times, you just made me crave everything! I forgot how much tasty food Colombia has. Hi Sarepa. I’m just fascinated with your love for Colombia. I don’t know if you’ve tried “solteritas”. I think they deserve to be included on the list. I just had a quick question. I saw somewhere on the blog some information about a medical service in Cartagena that comes to your accommodation should you need them. Could you redirect me to this part of the blog? Thanks ! The churros looks delicious!!! Where could I find a recipe for authentic Colombian churros?